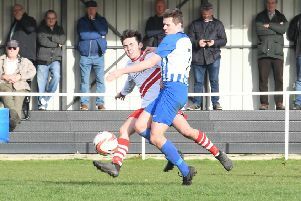 Skegness Town face a key relegation clash at Harworth Colliery on Saturday. While FC Bolsover look doomed in bottom spot in the Northern Counties East League Division One, having lost all 18 games, conceding 75 goals in the process, the Lilywhites and Harworth will both be looking for a key win to move up the table. Harworth are a place behind Skegness in 19th spot, with 12 points from 18 contests. With Town two points above them and having a game in hand, a win for Martyn Bunce and Nathan Collins’s side would be a big boost in their relegation battle (KO 3pm). The sides met a fortnight ago, and goals from Courtney Warren and Daniel Stevens gave the Seasiders a 2-1 home win.